This book has been on my radar since I first heard Nikesh Shukla talking about it at last year's London Book Fair, where I was lucky enough to hear him talk about the time he sent a porkchop into space. Yeah. That happened. In the current political climate after the complete shitstorm that was 2016, this is one of the most important books that any British person - or any person anywhere - should read. Even if you don't read much non-fiction or you're not keen on essay collections, I can promise you that this book is worth reading. Especially if, like me, you're white, privileged and currently living in the country you were born in. It's natural for us to be on edge if we think we're about to read something that's going to accuse us of racism. No one likes being accused of being racist - especially racists. The thing about racism is that you can be racist without really realising it; as a white person I have no right to tell a person of colour that something I just said to them wasn't offensive, especially if it's something they've felt offended by. The only thing I'm not privileged in is the fact that I'm a woman, and I know I hate it when a guy says something offensive to me and then tries to argue that it's not offensive because he didn't mean it that way. 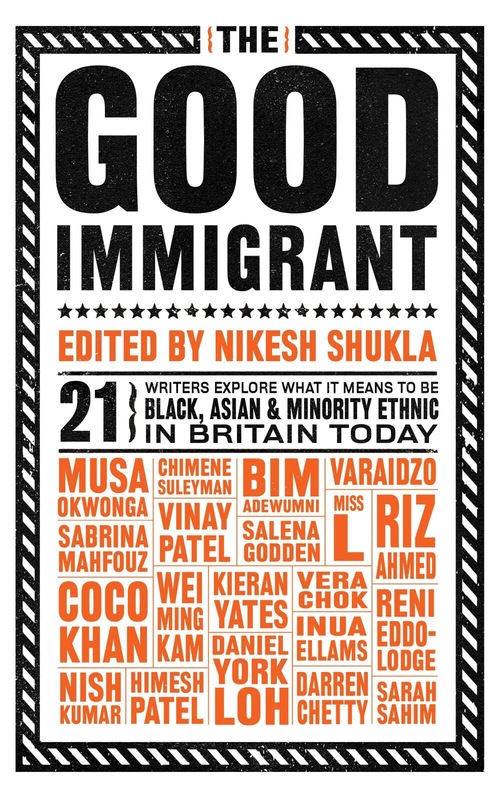 The Good Immigrant is the perfect antidote to ignorance, and while some of the essayists are very angry - and rightfully so - the collection as a whole doesn't feel like an attack, instead it feels like a group of people trying to explain why we shouldn't believe that there's no such thing as racism anymore, that just because you might not be racist isn't the point because racism isn't going to go away unless you start calling people out on their ignorance, even if those people are friends and family. Especially if those people are friends and family. As with all collections there were some essays I enjoyed more than others; I particularly enjoyed the essays written by actors because I'm always interested in the representation of poc in film and the media, but there wasn't a single essay I disliked and every single one of them made me think and made me consider what more I can do to stop my country from becoming the next Nazi Germany. That may seem like I'm being over-dramatic, but so many of the views being spouted by people in politics right now are the same views that were being thrown around Germany in the 1930s. Nigel Farage has directed hatred towards immigrants in the same way Hitler directed hatred towards Europe's Jewish population and it's dangerous. Basically I loved this collection and I do genuinely believe it's one of the most important books around at the moment. Please read it.